​Dr Phua obtained his medical degree from the National University of Singapore in 1997. He completed his specialty training in Respiratory and Critical Care Medicine in Singapore General Hospital in 2006, followed by a clinical fellowship in Pulmonary, Allergy and Critical Care Medicine at Duke University Medical Centre in USA from 2006-2007. His key interests are in intensive care medicine, allergy, lung transplant and medical education. He is a Visiting Consultant to the National Heart Centre as a lung transplant physician. In addition, he conducts regular sessions at the SGH Allergy Clinic, where he focuses on aero-allergen testing and immunotherapy. He is committed to medical education, and is actively involved in teaching medical students, doctors and nurses. 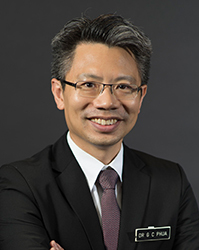 He serves as the Program Director of the Singhealth Internal Medicine Residency Program.